There are many SEO mistakes bloggers should avoid, although probably the most common is not to understand what Google is for. Once bloggers understand the purpose of Google and the other search engines, they will be more likely to avoid the 7 SEO mistakes listed below. So let’s spend a little time discussing why Google exists. We are using Google as an example because it is the most used search engine in the world (68% of searches in July, 2014.) The Chinese Baidu got 16% with Yahoo and Bing both below 7%. These four are the top four for 2014 to date, which is why we use Google as our example. The objective of Google is to provide its users with a good search experience. That means receiving results relevant to the keyword or search term they used to find information, and not receiving multiple pages with the same results (duplicate content.) Nor does Google want you to find poor quality results with very bad spelling and grammar, pages with lots of adverts above the fold before you reach any content or blog posts that are filled with false information. Google’s algorithms are designed to hunt out the poor quality pages, the pages full of adverts and the duplicated information copied from other sites. Instead, it focuses on providing quality web pages offering useful information to its users. Google is a search engine and it’s customers are those using it to find the useful information they want. Google and all other search engines focus on giving their users exactly what they are searching for. You do that by means of title tags, description meta tags and use of keywords in the text of your post. Google has developed techniques over the years to enable it to discriminate between a natural usage of keywords and keyword stuffing designed to fool the algorithms. There was a time when using multiple repetitions of keywords worked, but not now. Among the many factors that Google considers when ranking web pages in its SERPs are authority backlinks. These are links to your pages from other blogs and web pages containing high quality content related to your niche. Before doing this, however, the search engine must be able to assess the content of your blog post or page. The most important aspect of your SEO activity is to explain to Google’s algorithms exactly what your blog post is about. If you avoid the SEO mistakes listed here, you should be able to avoid being punished by Google for trying to fool it. If you go against Google’s terms of service then forget a high ranking – you would be lucky to even have your post indexed! 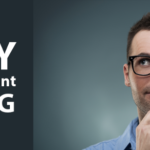 However – even more than that, by avoiding these mistakes you should be able to explain clearly to Google exactly what your post is about – and why it should receive a high ranking for the search term it is targeting. There are arguments for and against targeting specific keywords (search terms) but on balance, it is regarded as beneficial if you do. Each post should be directed to providing specific information that a reader might be looking for. Here is how to avoid doing that the wrong way. Before writing a blog post you should have in your mind exactly what its purpose is. You can just start writing and let your mind wander. The post must zero in on a specific topic, or even better – a specific problem that a reader might have. Such as how to avoid SEO mistakes! So you start by defining why you need to write this post, and what issues it is intended to remedy – just as we are doing here. Your posts must contain content related to something a reader wants to read about. If your blog is a celebrity news blog, then include posts about celebrities, sure. But if you want it listed in Google’s results pages, focus in on a specific aspect of that topic – a particular person or film studio. You can write 2-3 posts every day if you want, each focusing a different celeb. Fundamentally, a ‘lack of content’ refers to a blog post that does not offer the reader much information. It could be filled with uninteresting information, or it could even be too short. You can’t say much in 300-400 words. Google’s Matt Cutts states that he expects around 500 words plus. Sometimes even 700 words are insufficient to cover a topic. Even worse than poor content is copying content from other websites or blog posts. Google actively hunts down duplication of content. As explained earlier, it does not want its user to find multiple results that are exactly the same. Google will drop duplicates according to the authority of the domain as a whole, finishing up with just one version of any particular article or post. That might not be the original, so you should keep an eye out for people copying your content. Copyscape is a good service for this. Google rewards blogs that have multiple links back to them from other related web pages and blogs. The more authoritative the domain or even page providing these links, the higher authority weighting is given to them. Many bloggers will try to cheat the system by paying for such links, but Google is now wise to this. If it finds that you have been paying for backlinks, you entire domain is liable to be deindexed – meaning you have no listing at all. It’s not just the page or post receiving paid links that will suffer – it is your entire blog or website! Never pay for links in any way: by direct payment, by paying for guest posts that contain your link, or for receiving a link in return for providing one (reciprocal linking). It’s Okay for authority sites to share links this way, but not if Google suspects it is an arrangement. Avoid link-backs from web pages or blogs that are not related to the topic of the page the links appears on. Avoid having ‘links’ or ‘partners’ pages that contain only links from sites unconnected with your niche. Obviously Google staff cannot personally read all the many billions of web pages published on the web. The company relies on statistical mathematical formula to establish the content on each page of your website or blog. To Google, a blog post is a page, so we shall use the term ‘page’ and ‘post’ here as being the same thing. We shan’t discuss how algorithms and web spiders/crawlers work here – suffice it to understand that machines do it, and machines work to specific instructions. They do not ‘think.’ You must help them establish the content on your site. You do this by means of tags and vocabulary. Title Tag: Google will read the Title tag in the Head section of your HTML. This gives it a clue as to the topic of your post. This is also the title that will appear in the search engine results if your post is ranked. This should be a maximum of 512 pixels at Google’s standard listing font of Arial 16 pt. Do not allow your SEO plugin to automate your title tag – this can be different and more specific than the title of the post (H1 tags – see below). Post Title: You post title appears at the top of your post, and should contain your main keyword. This need not be the same as the Title tag, but it makes sense to make it the same. Description Meta Tag: The description meta tag in the Head section of your HTML gives the spider even more information about your page. This is the snippet that appears below the title in a Google listing. This should be a maximum of 156 characters and also contain your target keyword. H Header Tags: Google will seek out header tags in the body of your text. H1 HTML tags around a header or blog title tells Google that the text within these tags is important. H2 tags have secondary importance and so on. So if you are blogging about “how to train dogs”, with a section on training German Shepherds, your main header could be <h1>How to Train Dogs</h1> with a subheading later with <h2>Training German Shepherds</h2>. Google can then clearly see the hierarchy of the relevance of your blog post. Image ALT Tag: Google spiders/algorithms cannot read images. You should tell them what each image is about, using your main and secondary keywords to explain this. Add Alt=’your keyword + image description’ just before the final closing tag of your image HTML. For example: <img title="German Shepherd" src="" alt="How to train dogs image"/>. Should the image fail to resolve in a reader’s browser, this Alt tag will show instead, giving the reader some information about the missing image. The image title tag can be left blank, or a title added that shows on mouseover with most browsers. Keywords: This is discussed immediately below. Google uses an algorithm known as LSI (latent semantic indexing) that uses a character string recognition algorithm to establish the meaning of your post. In the past you may have got away with using your keyword multiple times, such ‘how to train dogs’ as 5% – 7% of the text in your post. No More! See below. 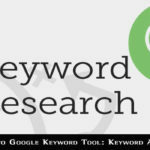 A keyword is the search term that you are targeting with your blog post. You want it listed when a Google user uses that specific search term in the Google search box. Bloggers still believe that 3% – 5% of the word count of their post must comprise the keyword. Google disagrees! 1%-2% might be Okay, but it is possible these days to be ranked in a high listing position for a keyword that does not appear anywhere in the text of your post. Semantic relevance of the general vocabulary used is just as important as they keyword itself. In fact, Google reacts badly to overuse of the keyword. A lot has been written about this, but research has shown that you should be fine if you use no more than 2% of a 1 or 2-word keyword, and 1% of a search term of 3 words or more. Just make sure that you use plenty of synonyms or related terms in your writing and you will do fine. There are cases where excessive keyword usage seems to work, but when you look more deeply, such pages also have a high level of authority backlinks, which have overcome any negative aspects of excessive keyword usage. On balance, keep your use of the main keyword only to where it makes sense to use it. You might think that a fantastic-looking blog must impress Google, irrespective of its content. Not true! There are a few reasons why this might not be good for you. Sure, a reader wants to visit a good-looking blog, but first and foremost they want useful content: advice or information related to the search term used to get to your blog. Google cannot read images, so if have loads of images but very little text content, then your blog might not be listed where you want it to be. Yes – your images might be listed in a Google Images search that uses the Alt tag, but that’s not what you want. So focus first on writing good, informative content. Having done that, then add your images, but not so many they hide the content. Lots of images and Flash can slow down the loading speed of your blog dramatically – speed of loading is one of Google’s ranking factors. You should not only link your current blog to any other websites or blogs you run, but also link blog posts to others that are related to the same topic. 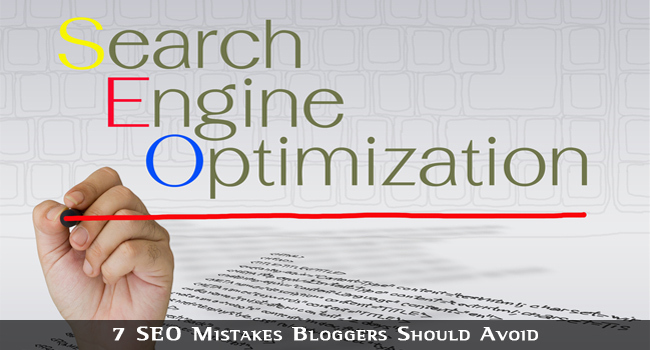 You can optimize the internal ranking of any page on your blog or even a regular website. Each page or post starts with a PageRank point of 1, which can be shared between all the links leaving that post. Not only does Google allow you to optimize the disposition of your internal PageRank points, but it also likes links between pages of related content. You may not get the same authority rank as you would through links from external blog pages or web pages of similar content to yours, but it does help the Google PageRank of the posts or pages you choose to link internally. These are our 7 SEO mistakes bloggers should avoid. If you can avoid all seven of these, then you will have a far better chance of your individual pages being given a high ranking Google’s search engine results positions. It will also help to become familiar with Google’s main algorithms and their updates, such as the Page Layout algorithm, Hummingbird, Panda, and the various Penguin updates. 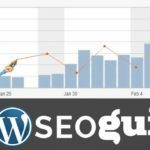 The higher your SERPs ranking, the more traffic you tend to get, and the more traffic… well, that is up to you!